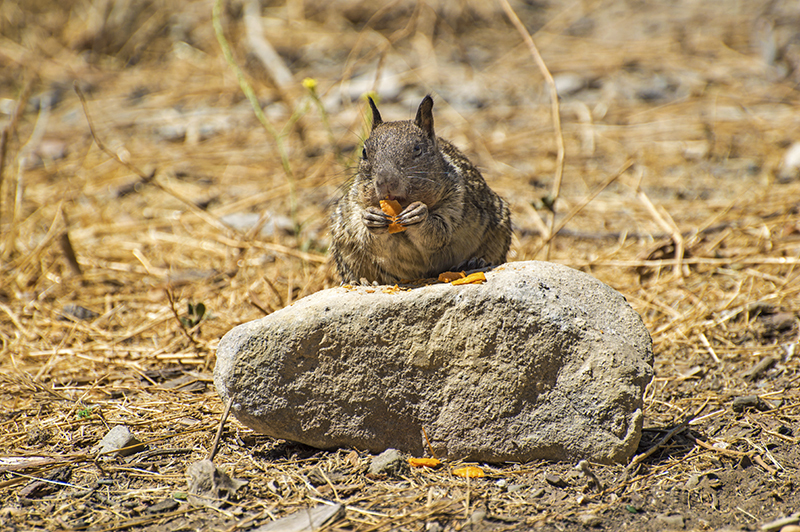 I was invited up for the day to visit some friends that were camping for a week at Leo Carrillo State Park. It is just outside of the main part of Malibu so from Oceanside I was thinking it might be an hour and forty- five minute drive. On a Tuesday morning however, it actually took two and a half hours and that was virtually with no traffic. 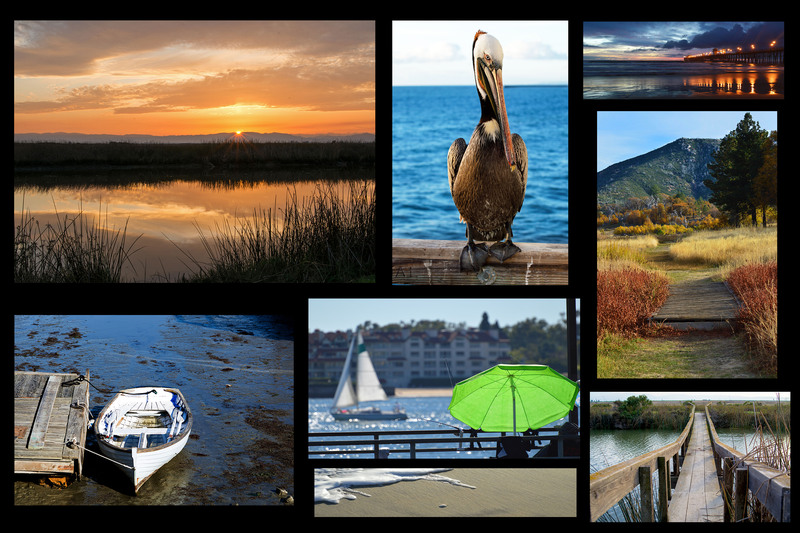 As I was driving back home later in the evening, I thought to myself that it was well worth the drive! 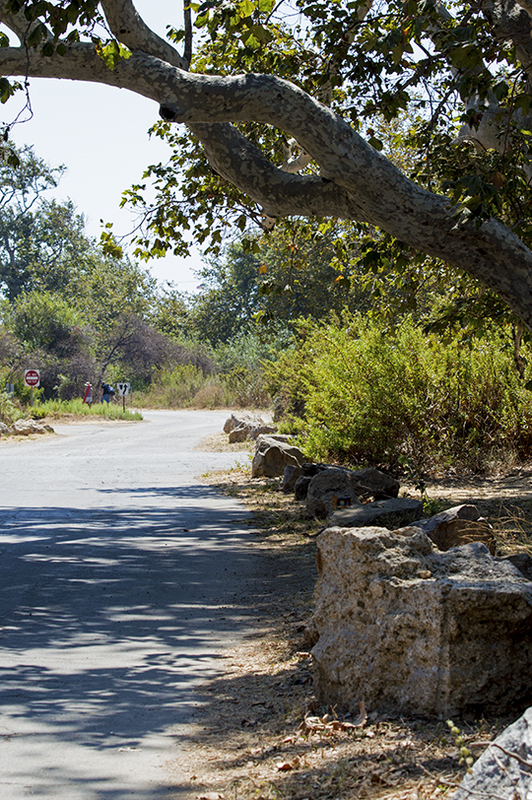 Leo Carrillo State Park can be easily accessed from Southern as well as Central California. As I was nearing the park entrance, I noticed a sign that said 21 miles to Oxnard. I didn’t realize how far up the coast I had traveled. 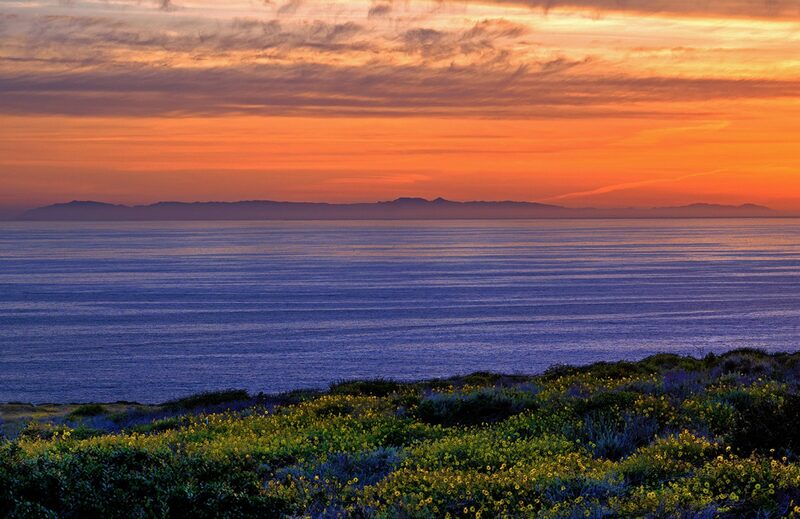 Driving north through the main part of Malibu past Pepperdine University and Zuma Beach, the state park could go unnoticed unless you were actually looking for the sign. Obviously some people know all about this place as the campground was full and even though it was mid week, there were scores of people on the beach. 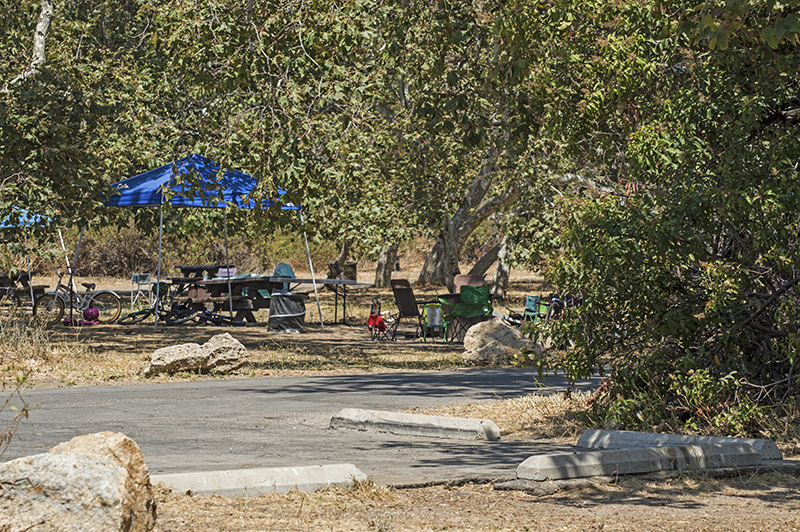 Even if you are not camping, you can use the day use parking for $12.00 a day. 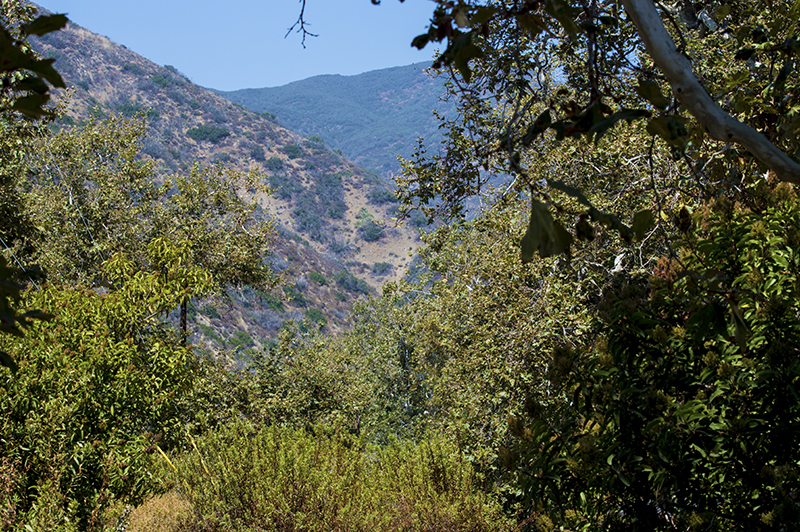 The campground sits amongst the Malibu hills and the campsites were surrounded by every type of tree imaginable. 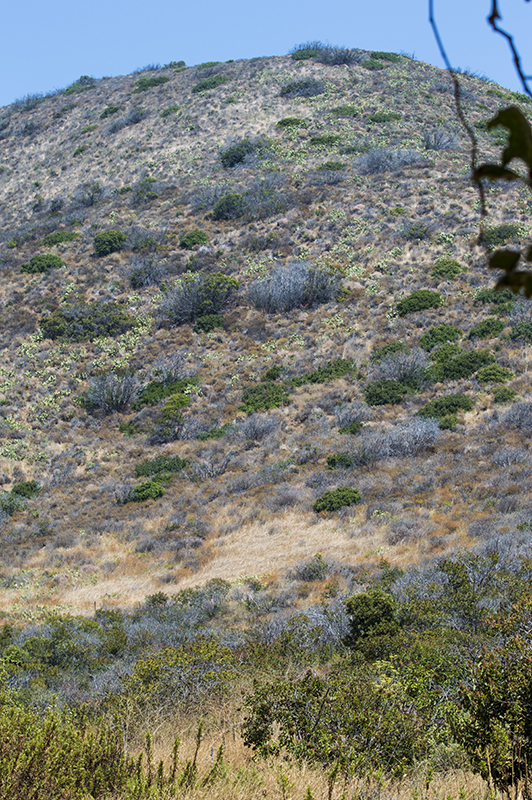 If you really stretched your telephoto lens, you could also see a few sizable mansions way up in the hills. 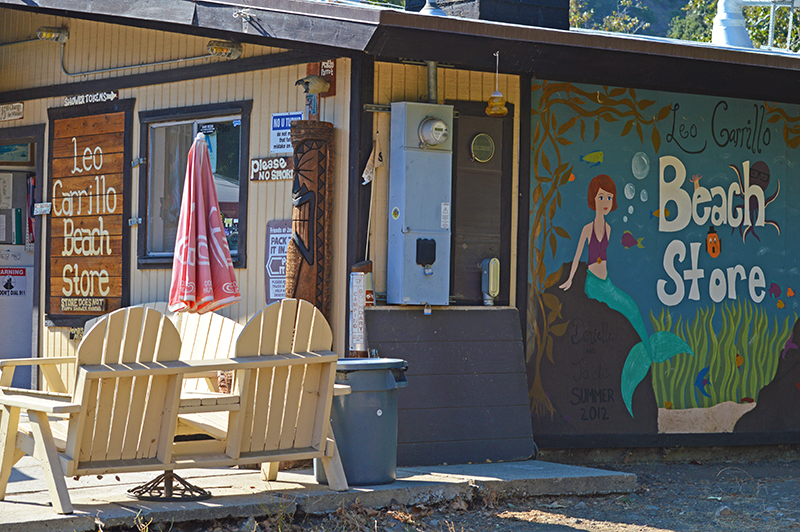 Besides having some of the largest campsites I have ever seen, the park also provided a picnic bench,a fire pit, and a cute little store was on the premises. There were plenty of birds in the trees and you could hear them squawking from far away. They added to the wonderful sounds of nature that went along with the frogs and crickets at night. 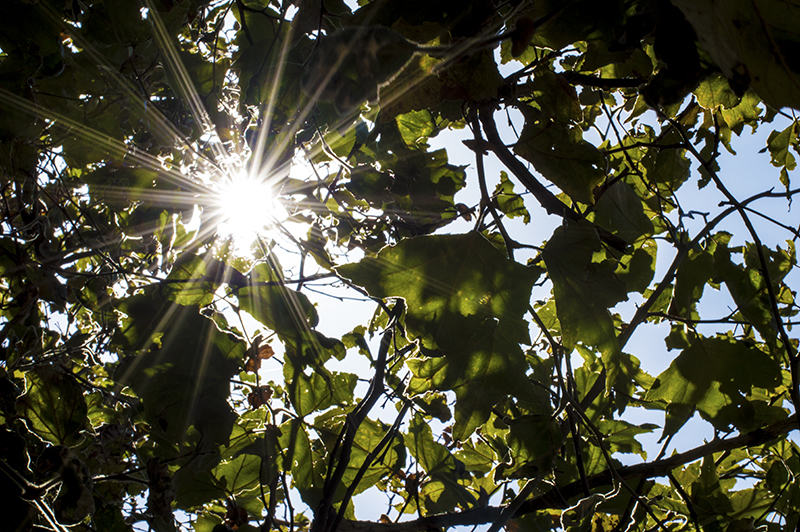 It is nature’s ambient music at its best. 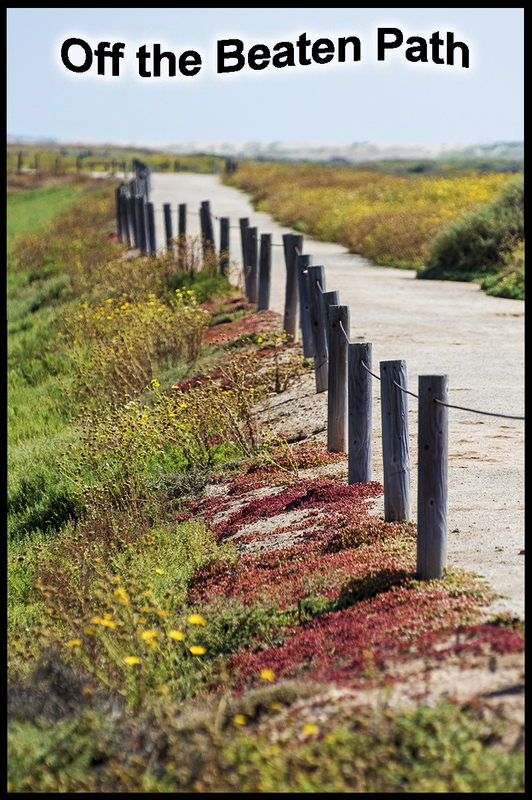 Relaxation is what these campgrounds are all about, however, with the beach so close it allows for playtime too. After a great lunch it was time to take the short walk to the beach. We crossed through the parking lot and walked under the Highway 1 bridge. 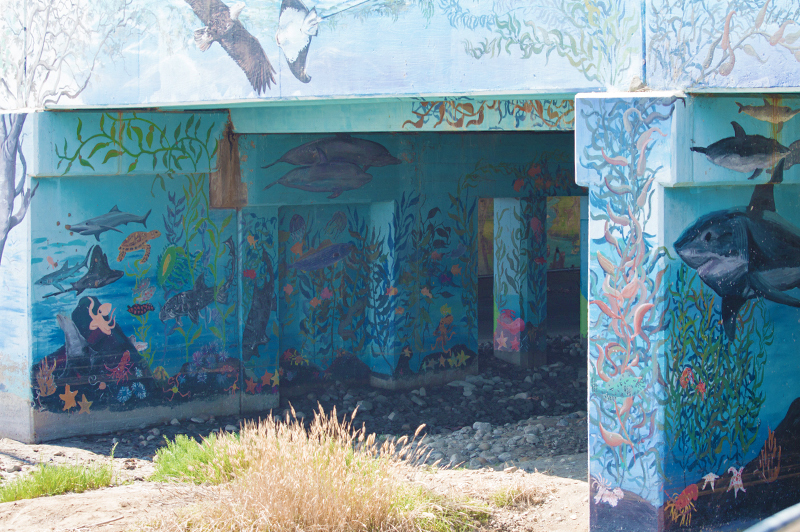 Colorful marine life paintings greeted you on the walls and columns of the bridge as you made your way to this popular sand playground. 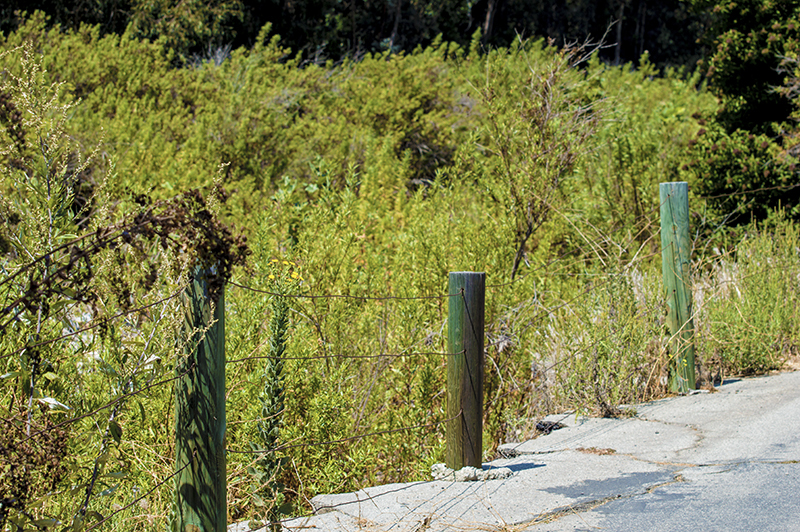 The surf culture has heavy roots in Malibu and the beaches that stretch out nearby. 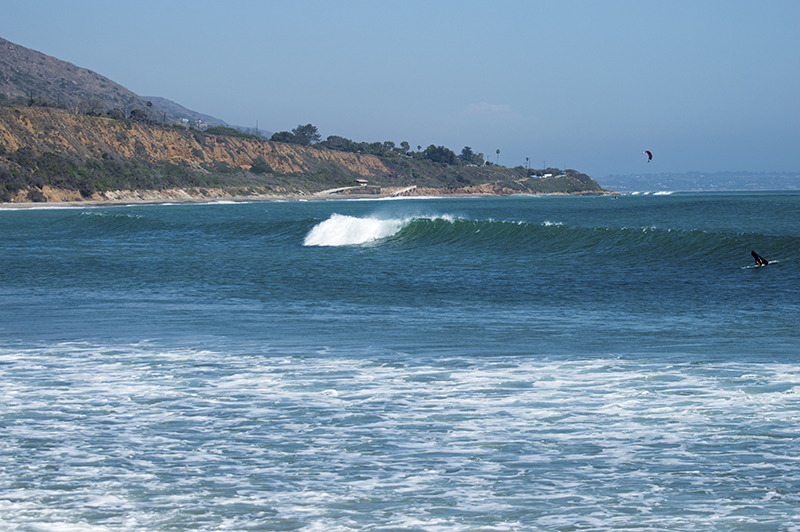 On this sunny and beautiful August day, the offshore breeze was feathering the tops of the waves making for optimum surfing conditions. 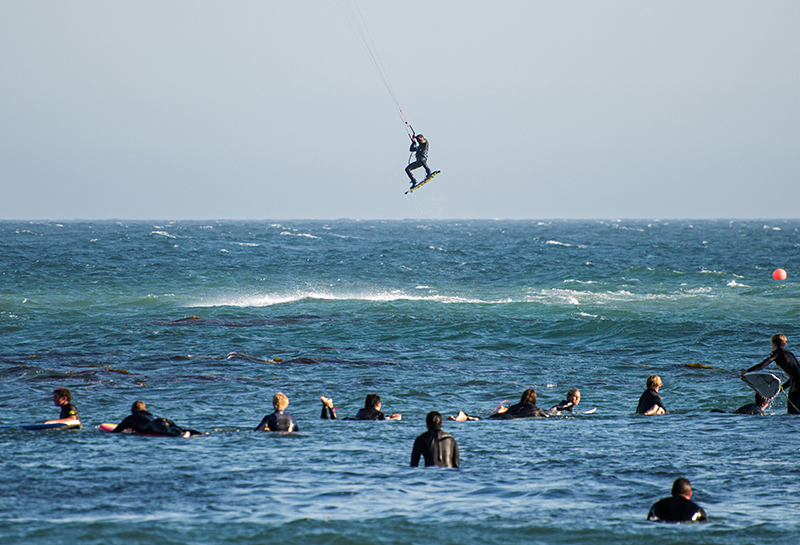 Each generation of surfer could be seen entering the water. The high school age kids riding the smaller surfboards were flying across the wave while maneuvering the surfboard up, down, and vertical. 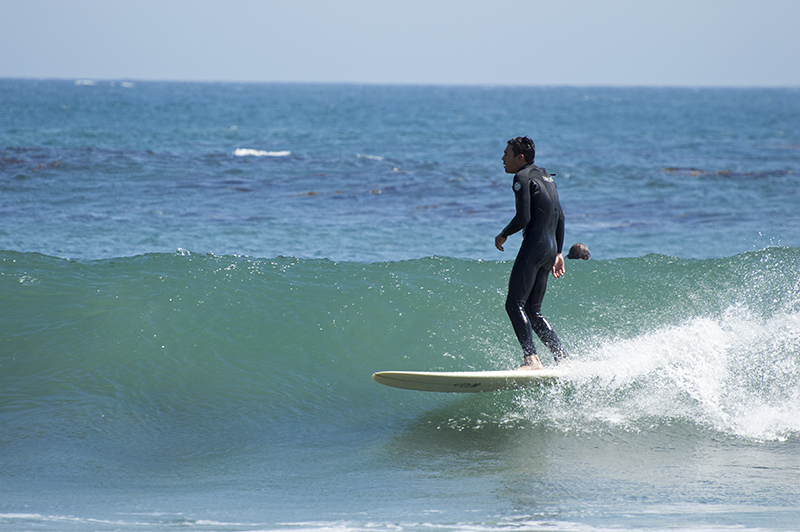 In contrast, the long boarders were cruising the face of the wave while performing fancy footwork with a classic style. I wondered if the groms appreciated this style of riding and the skill it takes. 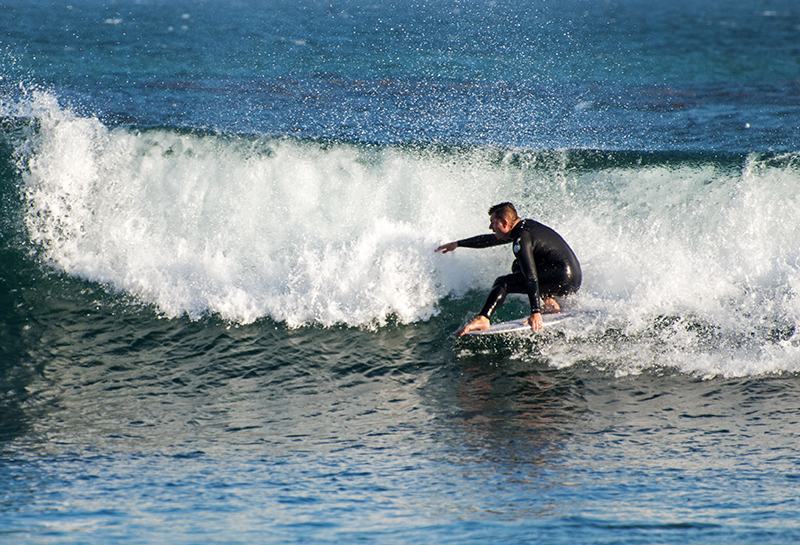 As I glanced down the beach keeping my eye on one particular long boarder, I marveled as his smooth stride took him from the middle of the board to the very tip where for just a few seconds, his ten toes dangled over the nose ever so slightly. “Hanging ten” as it is famously called, made me feel nostalgic as this was the preferred move in the 1960’s when surfing became popular. In the nineteen sixties, legends of the sport like Mickey Dora ruled the Malibu coastline and brought the sport notoriety. Again, I wondered if these youngins knew who Mickey Dora was. I wonder if they know how much their area influenced that sport. I was thinking probably not just as a teen was soaring across the face of the wave while executing some pretty impressive moves. 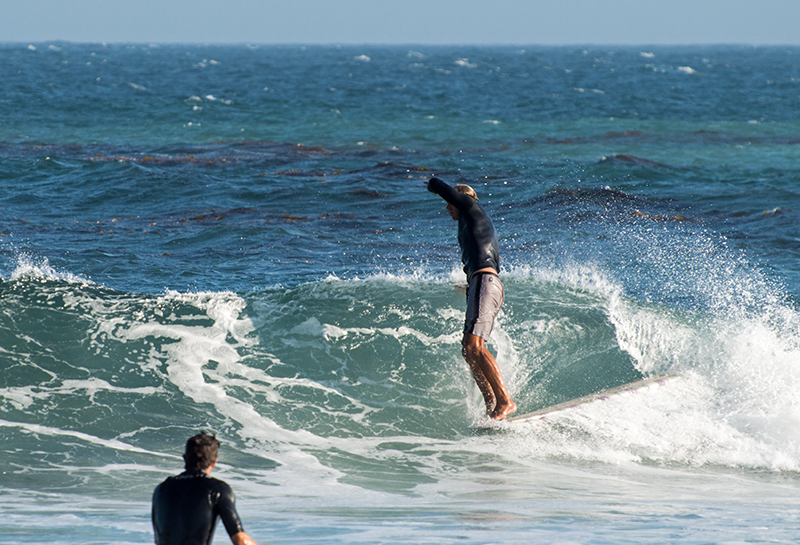 I have to say, these young surfers were pretty darn good, but hanging ten in Malibu…that is history!! Besides the surfing waves which were crowded, kite surfers could also be seen just beyond the breakers. 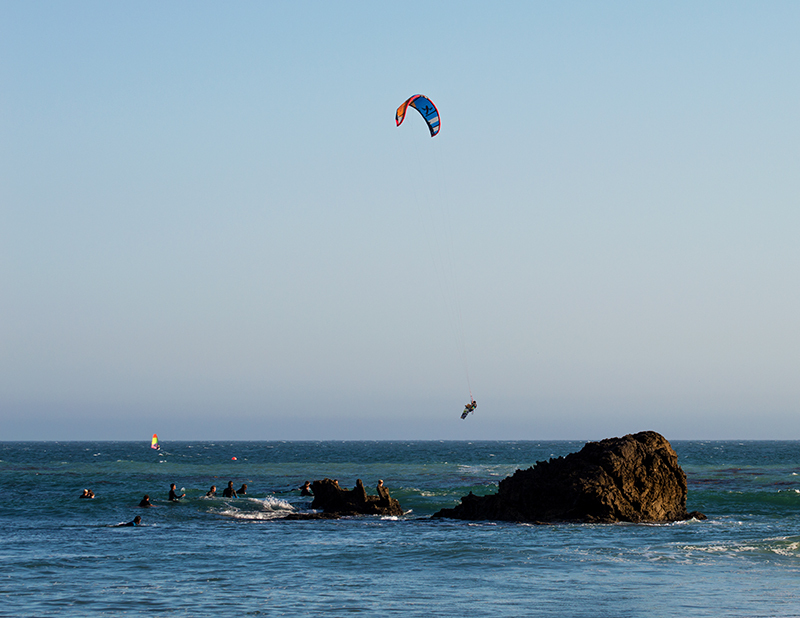 Once in a while you saw a kite heading skyward and just below, the rider was flying high, far above the ocean surface. Surprisingly they landed back on the water just as smoothly as when they took off. Sharing the water and sometimes the waves, wind surfers were also out to play. 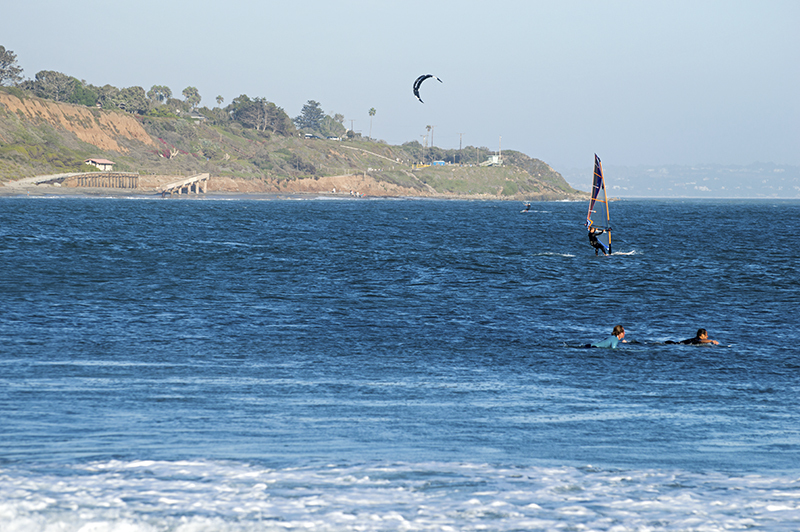 The amount of kite boarders far exceeded that of the windsurfers. Still, it was nice to see all of the activity in the water. It was a water sports playground! . 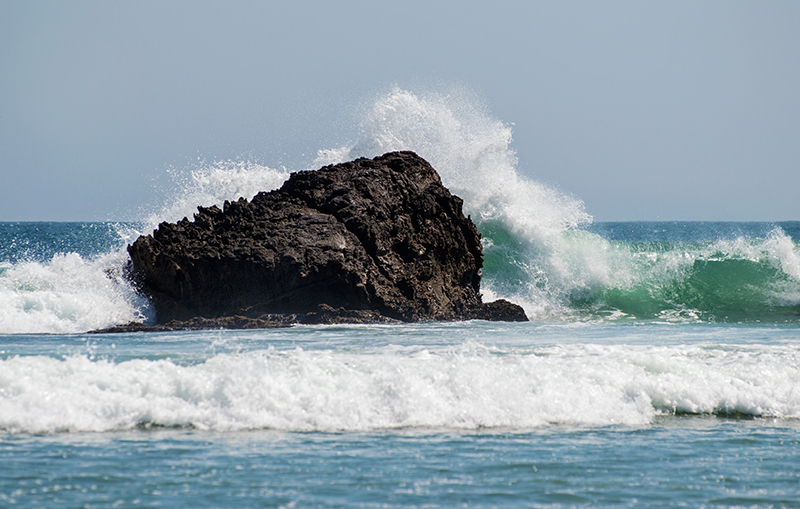 Large rock formations offshore created a great background and were the preferred starting point to catch the waves. 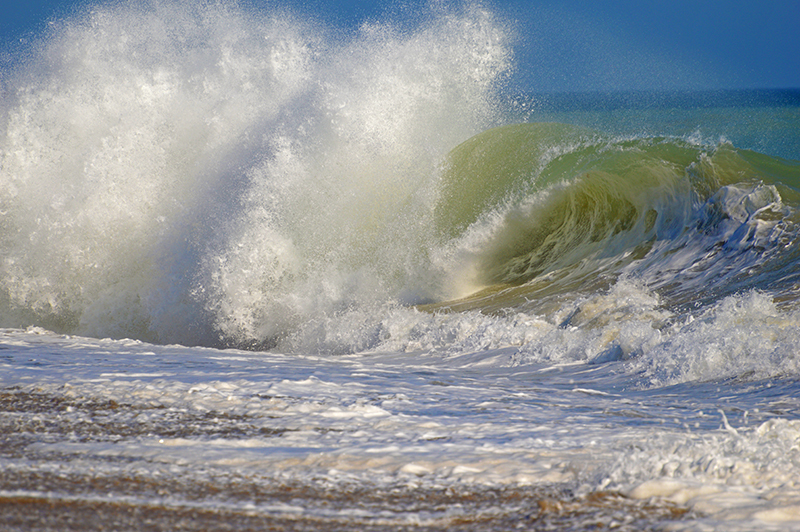 On large sets, the waves pounded on the rock with a huge explosion. There was also a rock mound on the beach which is home to a cave that I didn’t get a chance to see. Right next to it the ocean was a little calmer making for a perfect family beach. There were tons of kids on this Tuesday and with all of the teens in the water, I’m thinking, “don’t they go to school?” The accessible parking and plenty of bathrooms made this a perfect place to spend the day. I am sure on the weekends it is packed, so I happily enjoyed my relatively un-crowded day at the beach. Smaller rocks were just beyond the sand and during low tide, they become tide pools rich with sea life and sea critters. With rocks so close, I thought of only one thing…sea glass!!! 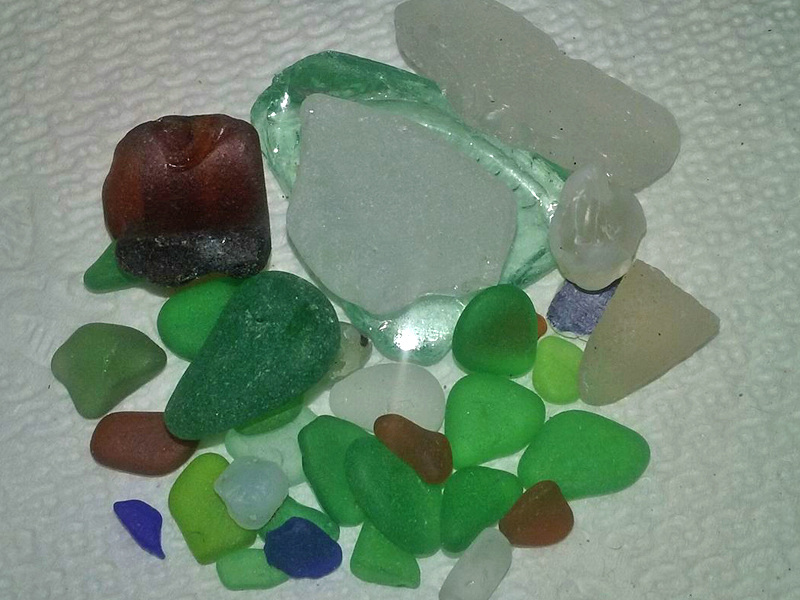 I scoured the sand and rocks for at least an hour and was rewarded with over 30 pieces. 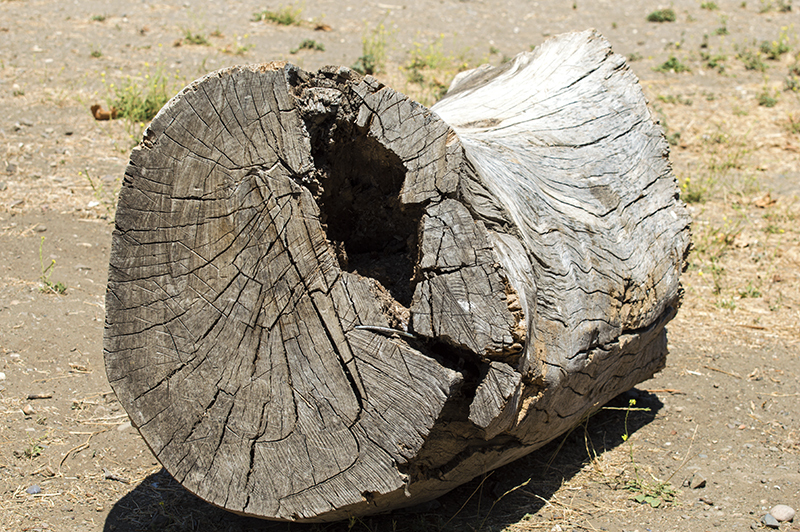 Ninety percent of them were prime quality distinguished by having a frosted look and soft edges. Although very small, I even found a few blue pieces which are more elusive. The rocks weren’t too pleasant for the surfers as they had to traverse over them on their way in and out. Most of them moved very slowly and used their upside down surfboard for leverage. My friend swore that she saw an actor from the hit show ”Animal Kingdom” but I never saw his face. It wouldn’t surprise me though as this beach still is and has been used for tons of TV shows as well as movies. 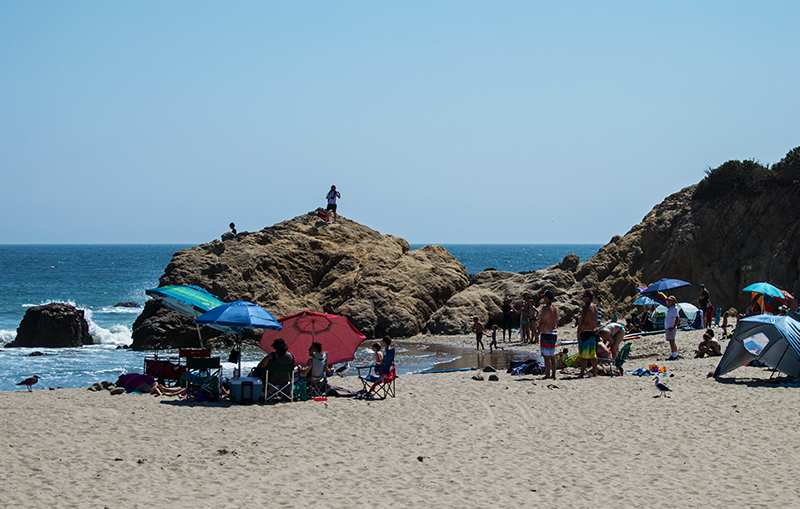 The park is named after the late actor and conservationist Leo Carrillo, and was a location scene for movies such as “Letters from Iwo Jima”, “Grease”, “Pirates of the Caribbean”, and culture films like “Gidget”, and “Beach Blanket Bingo”. I wonder if any of the groms out in the water knew any of these movies? Again, I’m thinking probably not. Well maybe “Pirates”. The cameras have rolled many times on this beach and looking around, I think I remember a few commercials or movie scenes. As an example, that sea cave that I didn’t see was the site for the movie “The Usual Suspects” where the characters dug a grave for the body of Benicio Del Toro. However, the sand at Iwo Jima is black so they had to cart in tons of it while laying down plastic to separate it from the regular beach sand. Quite a production, I am sure. No filming was done the day I was there although we saw something being filmed along Coast Highway on our way back. If it wasn’t for the sighting of the “Animal Kingdom” actor (or so she says), it was pretty much a non-Hollywood day. Save for a few Rolls Royce’s and other luxury cars that we saw while driving on Pacific Coast Highway, it was just an average day at the beach. On the other side of the rock formation there is another stretch of sand which spanned what seemed like miles. It was windy and un-crowded which was probably because the waves pounded right on the beach. If my left brain was saying go in the water, my right was saying, heck no!!!! It looked painful as you would have been hammered right on rocks. Yes, right brain knew best. It was just such a different scene from the calmer family beach just around the corner. We decided we liked the more crowded yet calmer beach so we headed back with chairs in hand to watch the sunset. We were quite puzzled when it was about 20 minutes before the designated sunset time and the sun was over my right shoulder. Almost behind us! It was weird seeing the Pacific Ocean right in front with no sunset. It wasn’t like it was blocked out by a hill or something, it was just in a whole different direction! It must have been the time of year of where the sun was versus where the beach faced, still very odd. With the day becoming darker we headed back to camp to enjoy dinner and dessert consisting of s’mores cooked on the fire. I was so relaxed; I had to pull myself out of the chair to get ready to go home. 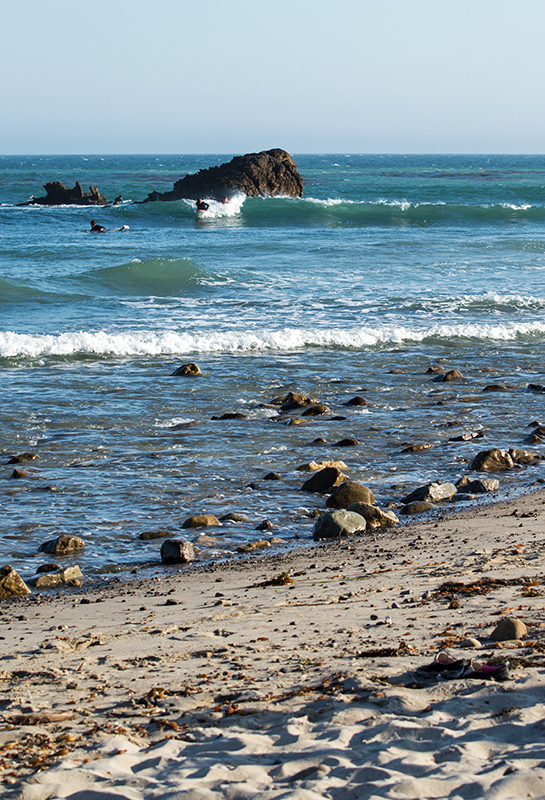 Leo Carrillo State Park and Beach is a great area and well worth checking out either for the day or the week. If you like to day dream like I do, imagine you are on the beach with Annette and Franky while Mickey Dora glides by with ten toes on the nose. On PCH James Dean drives by in a bright red convertible while Marilyn Monroe is dining nearby at a fancy beachfront restaurant. Of course there is a good chance you don’t know who any of these people are, in that case forget the daydreaming and just enjoy a fun day on the beach! This is definitely a good summer beach adventure. 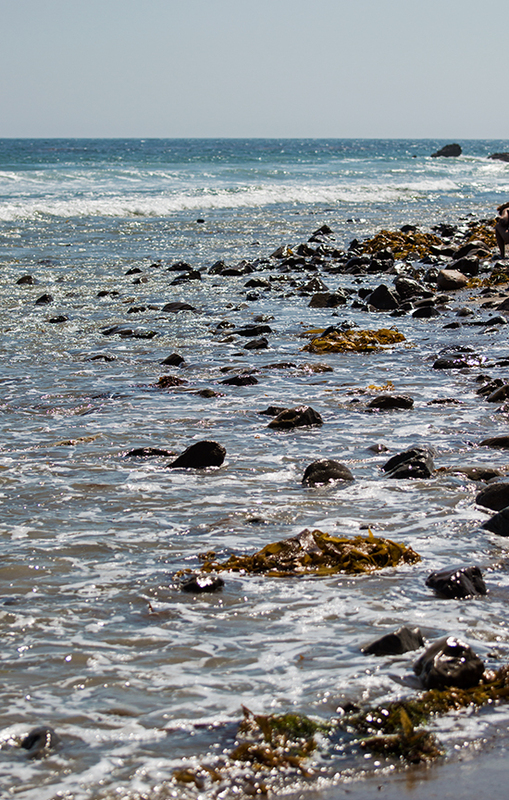 The kids love the tide pools and exploring the rock formations after splashing around in the ocean.